It originated at the Scott Experimental Station, Agriculture Canada, was tested as Scott #1, and introduced in 1933. The tree is moderately vigorous, rounded to spreading, and annually productive. It is hardy to Zone 1, and moderately resistant to fire blight. The fruit is medium large in size, 3.5 cm (1.5") in diameter, round ovate, and matures in mid to late August. The skin is thin, greenish-yellow well-washed and striped with dull red. The flesh is yellowish-white, firm, crisp, sub acid and sweet with a pleasant flavour. It is good for fresh eating, juicing and canning but goes mealy quickly. It stores for only 3 weeks. It is also very useful as an ornamental because of profuse bloom. 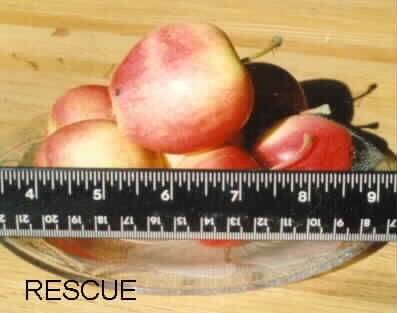 From the USDA Germplasm website: Fruit: size 3.5 cm crabapple, yellow-green with carmine red blush. Dessert, canning and juice. Slow to brown, soon goes mealy; productive and keeps quite well if picked when ripening. Manchester notes "tree-ripen fruits are translucent and very sweet. Give satisfaction with Heyer 12 or Dolphin as pollinator. Worthy of planting anywhere". No tolerance to chlorosis.